Golf and All Its Glory offers an overflowing history of the popular game. From its professional beginnings at the Royal and Ancient Golf Club to the competitive rise of the PGA, the series looks at every facet of the sport. 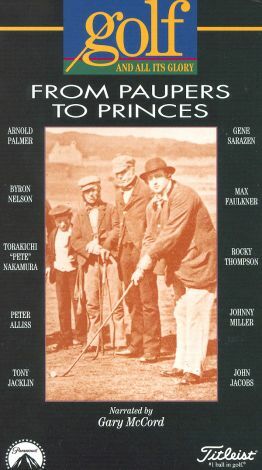 From Princes to Paupers features interviews with such heavy hitters as Jack Nicklaus, Arnold Palmer, Greg Norman, Gary Player, and Sam Snead. The first volume explores the creation of golfer as sports star. Golf and Its Glory also expands upon the history of the ball and club with "The Magic of the Majors" and "Links to Tradition."